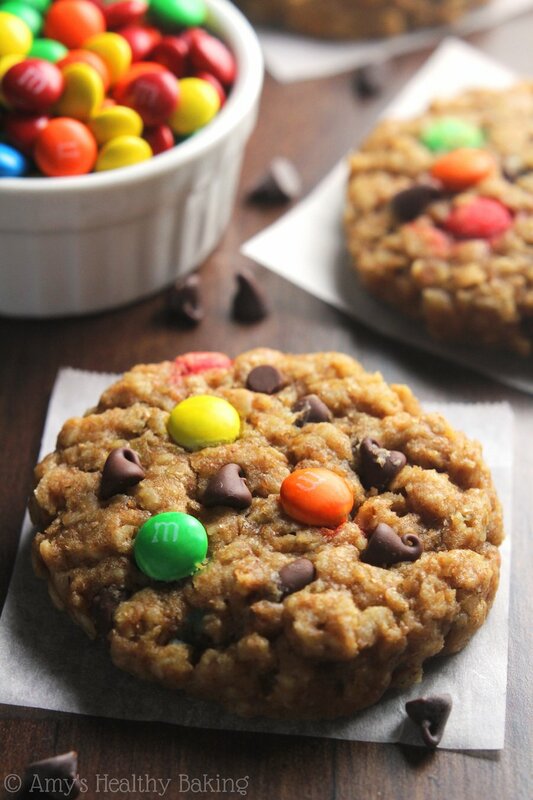 Chewy peanut butter oatmeal cookies full of chocolate chips & M&M candies. 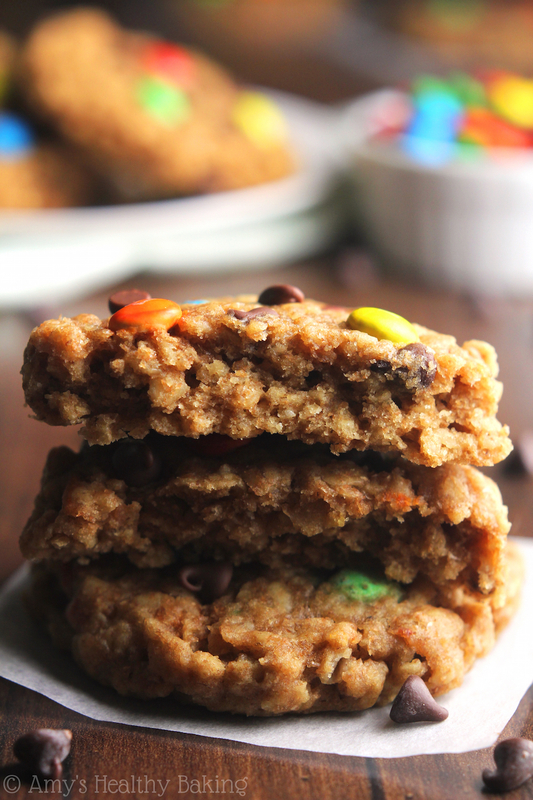 They’re oh so irresistible—but low calorie, whole wheat & guilt-free! Just over a year ago on a rather warm spring afternoon, I wandered up and down the aisles of Target, soaking in the free air conditioning and testing my willpower in the kitchenware and baking aisles. I swear that half of the colorful bowls and chocolate bars I end up buying fall into my basket on their own when I’m not looking! I scanned the cartons of ice cream, my indecision taking its sweet time figuring out which flavor sounded best while my toes threatened to go numb. On the very top shelf, almost out of sight for a short person like me, I spotted pumpkin pie ice cream—in April. Score! Before pulling open the freezer door, I glanced over the rest of the cartons to make sure I wasn’t missing anything. With my fingers on the handle, I paused when I saw another flavor: monster cookie ice cream. Confused, I leaned in closer to look at the picture. What exactly is a monster cookie? One with googlie eyes? Although the container lacked a description, I deduced that monster cookies included M&Ms… And that was about it. So I reached for the pumpkin pie and made a mental note to research “monster cookies” when I arrived back at home. For those of you imagining sharp teeth and buggy eyes like me, monster cookies are anything but that! 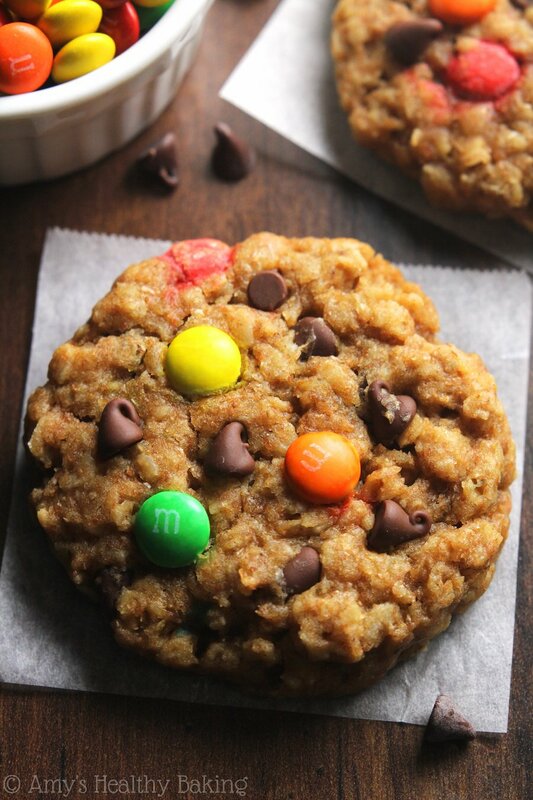 They’re harmless treats of peanut butter oatmeal cookies full of chocolate chips and M&Ms. 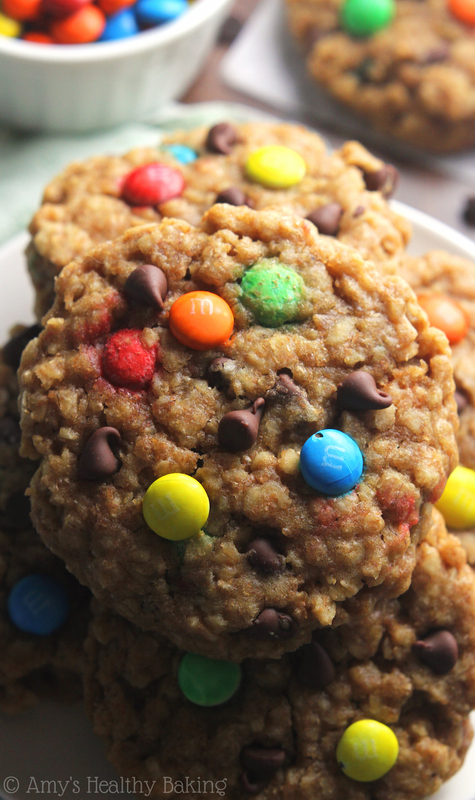 And finally, one year later, I created my own Healthy Classic Monster Cookies recipe for you! 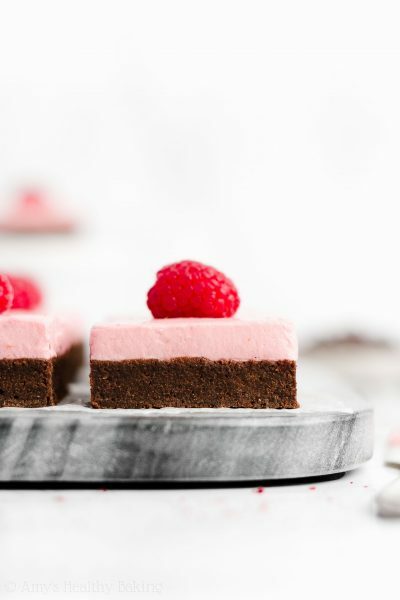 This dessert combines three of my favorite recipes into one irresistible treat. 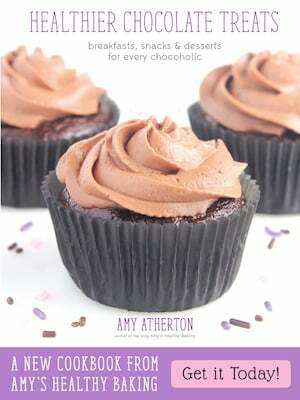 So let’s talk a little bit about what each recipe contributes! 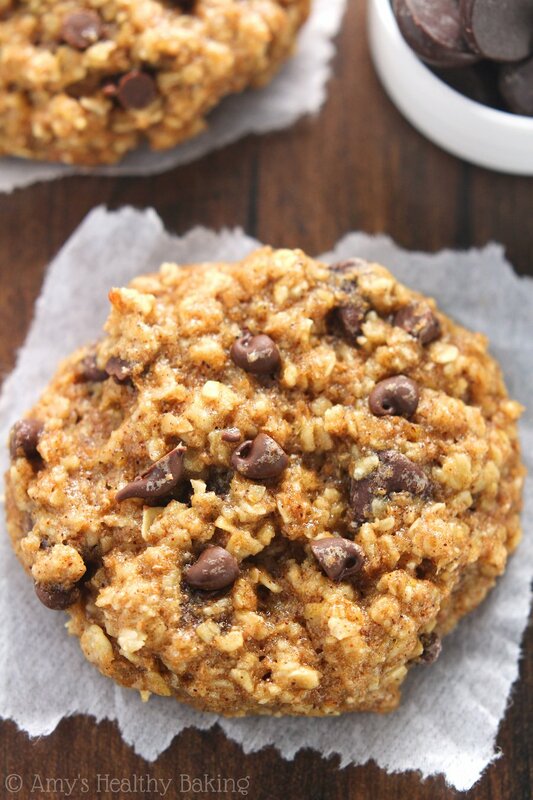 When it comes to oatmeal cookies, I want mine chock full of oats. 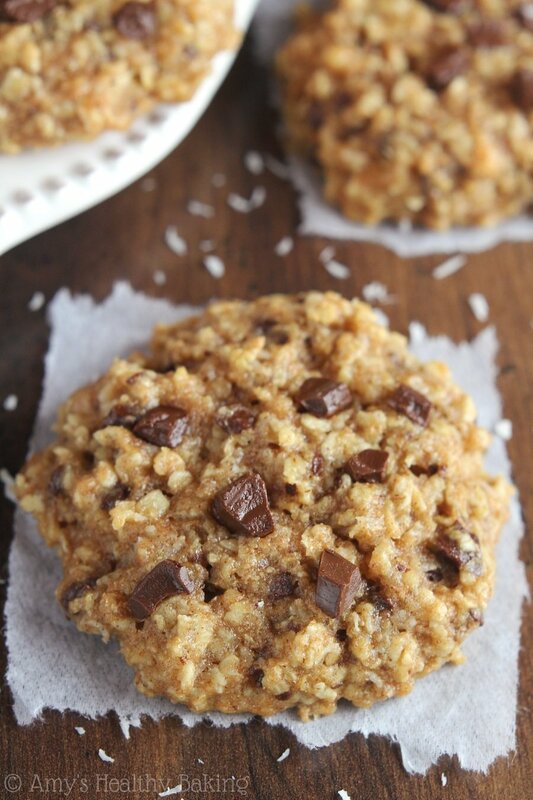 One fleck of oatmeal here and another one there just doesn’t cut it—those are just “cookies with oats” to me. So in these oatmeal cookies, just like my other clean-eating ones, we use more oats than flour! 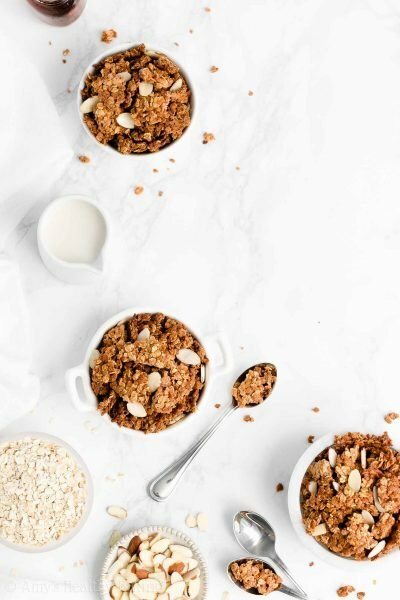 Instant oats (aka quick-cooking or minute) are the best, but you can make your own in a pinch by grinding old-fashioned oats in a food processor for a few seconds. I think it’s pretty obvious what the peanut butter cookie recipe contributes: the peanut butter! 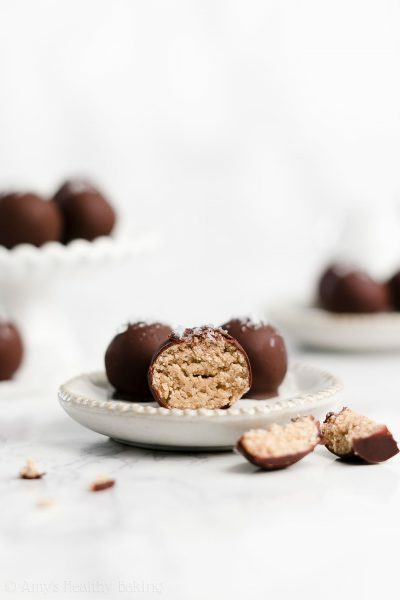 To keep these cookies lighter than traditional versions, we’ll use creamy peanut butter as the main source of fat, while eliminating the egg yolk and reducing the butter to just ½ tablespoon. That shaves off quite a few calories—and packs a big punch of peanut butter flavor! Finally, the last cookie recipe contributes the ratio of chocolate to cookie dough. We’ll use half mini M&Ms and half mini chocolate chips. I prefer to use the mini versions because their small size ensures you get chocolate in every bite! I hate the disappointing feeling of biting into a chocolate chip cookie only to end up with a mouthful of cookie… And no chocolate. Why bother? But these fun cookies are the exact opposite! After chilling, baking, and cooling, these Healthy Classic Monster Cookies didn’t stand a chance. I ate three in one sitting! No shame, no guilt. My life’s motto is “I run for cookies,” and these were worth every single mile the next day! 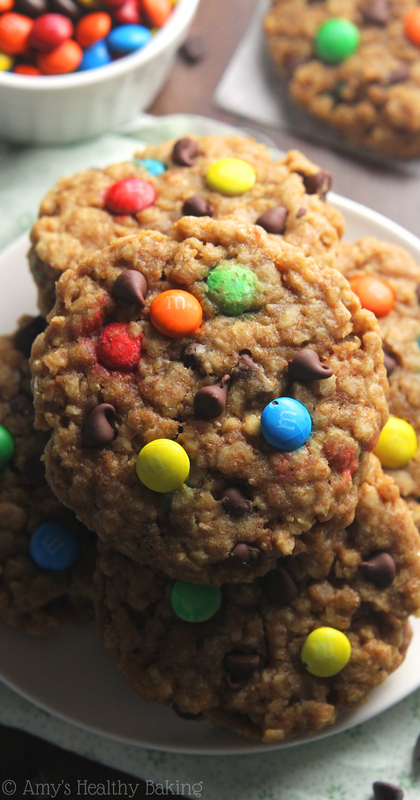 These monster cookies contain a little bit of everything! 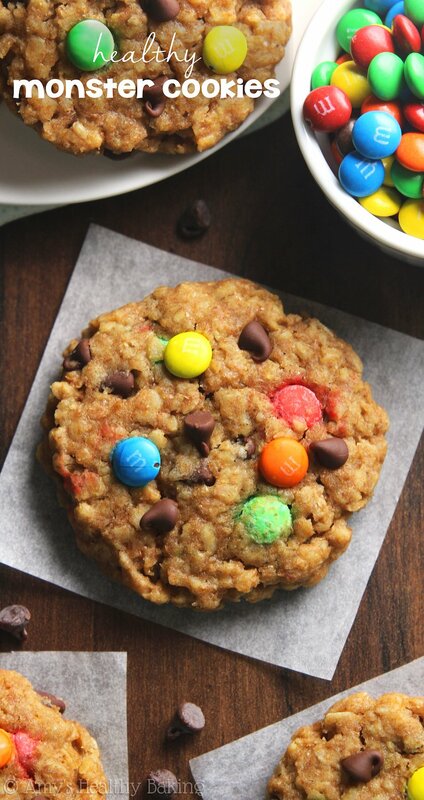 Peanut butter, oats, chocolate chips, and M&M candies. No wonder they’re so irresistible! Store any leftovers in an airtight container for up to 1 week—if they last that long! Whisk together the oats, flour, baking powder, and salt in a medium bowl. In a separate bowl, whisk together the coconut oil or butter, egg white, and vanilla. Mix in the peanut butter until smooth. Stir in the brown sugar and milk. Add in the flour mixture, stirring just until incorporated. 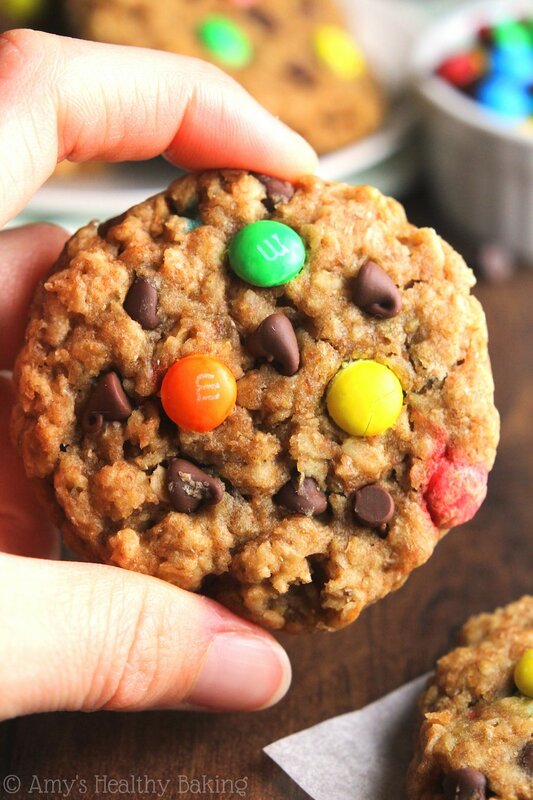 Fold in 1½ tablespoons of M&Ms and 1½ tablespoons of chocolate chips. Chill for 30 minutes. Drop the cookie dough into 15 rounded scoops onto the prepared sheet, and flatten to the desired thickness and width. 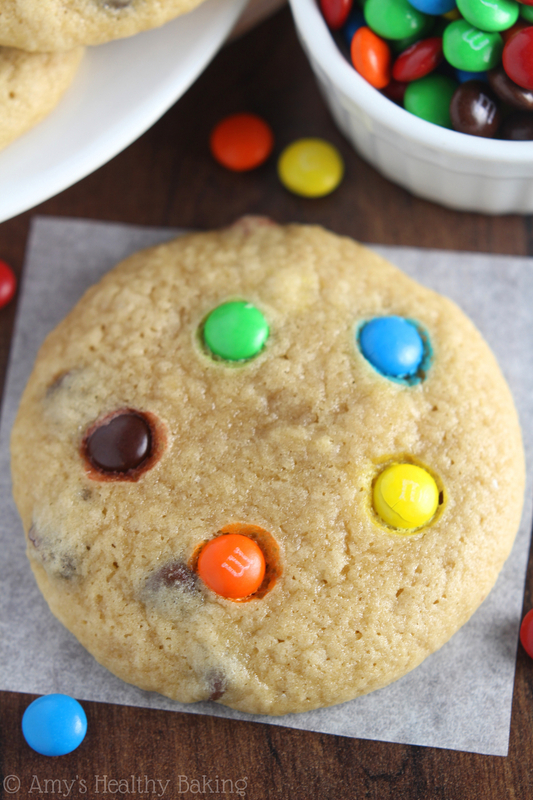 Gently press the remaining M&Ms and chocolate chips into the tops. Bake at 325°F for 10-13 minutes. Cool on the pan for 10 minutes before turning out onto a wire rack. For a gluten-free version, use gluten-free instant oats and a gluten-free flour blend. I recommend the following blend: ½ cup (60g) millet flour, 2 tablespoons (15g) tapioca flour, 2 tablespoons (17g) brown rice flour, and ½ teaspoon xanthan gum. I used Skippy Natural Creamy Peanut Butter in this recipe. Any brand of creamy peanut butter will work, and although I haven’t tried it, I believe that homemade should work as well. If you prefer, ½ cup of honey, maple syrup, or agave may be substituted in place of the brown sugar and milk. For more help and tips, watch my video. Hi, I’m just a bit confused since all your other oatmeal cookie recipes use a whole egg, does this recipe use a whole egg or just the white? Just the white! The majority of my oatmeal cookies do use the full egg, but not all — like this one. 🙂 I can’t wait to hear what you think of these cookies Millie! Thanks for sharing this recipe. I am eager to try these. I grew up making them and the reason we called them monster cookies was because they were so big, probably 3 to 4 inches in diameter. That must have been quite a delicious treat! 🙂 I can’t wait to hear what you think of these cookies Julie! Hi! Do you think these would freeze ok? 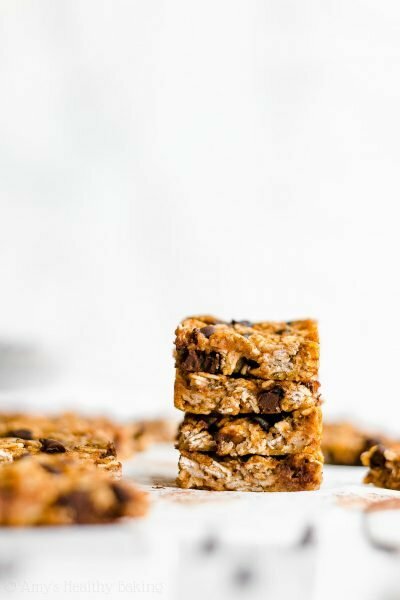 My kids love them and I was thinking about making a big batch ahead of time to take on a camping trip! I’m so glad your kids are enjoying these cookies, Summer! That means a lot to me! 🙂 Once baked, these cookies freeze really well. That sounds like such a fun idea to bring them along on a camping trip! My family used to go tent-camping at least twice each summer, so now I’ve got all of these fond memories floating through my head. 😉 I hope you have a wonderful time! 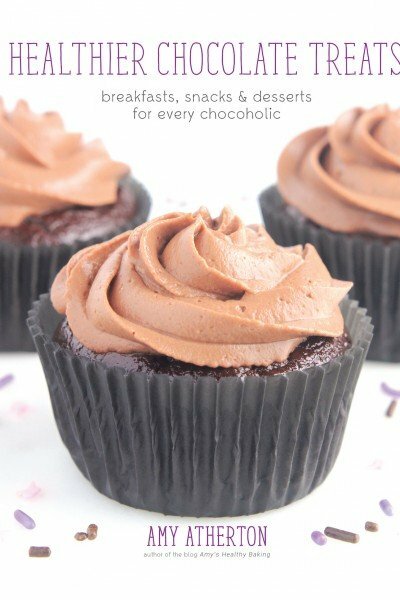 Tried this recipe last night, followed exact recipe with no changes and they were perfect! Better than expected. Will try using ~1/4 C brown sugar and ~1/4 C maple next time instead as sweetener with a bit less milk to keep things even. As stated in directions, make sure to shape as you want them before putting them into oven to bake – these do not spread like other cookies due to the ingredients! Thanks for the yummy recipe. I’m so glad you enjoyed these cookies Kate! That means a lot to me that you’d call them perfect! 🙂 If using ¼ cup of brown sugar + ¼ cup of maple syrup, then you’ll need to add about 2 tablespoons of milk to get the correct consistency and texture. Hopefully that helps when you bake them next!